Uganda is primate country. Gorillas, chimpanzees, baboons, and monkeys, but one primate species that stands out is the golden monkey. Very rare and elusive, tracking the golden monkey in Uganda can be quite interesting and adventurous. Golden monkey tracking can either be done in Uganda, or in Rwanda. Mgahinga gorilla national park in western Uganda is the perfect place to go tracking golden monkeys. The bamboo forests of Mgahinga provide a much appreciated habitat for these endangered creatures. Tracking golden monkeys is not as popular as tracking gorillas but it is exciting all the same. The Virunga volcanoes provide a very scenic backdrop for golden monkey tracking. Golden monkey tracking in Uganda. To go golden monkey tracking in Uganda, you need to pay $50, (in Rwanda it is $100) a lot cheaper than the $500 and $750 for gorilla trekking in Uganda and Rwanda respectively. In Mgahinga gorilla national park, golden monkey trekking starts at 8.00am. There is brief orientation on what to expect and what to do or not to do while in the forest. You are then separated into groups with guides and off you go tracking monkeys in the bamboo forest. You can pair golden monkey tracking with another activity or activities. If you want o go golden monkey tracking in Uganda, you can always add gorilla trekking, or mountain climbing or bird watching, cave exploration and so much more to your itinerary. That way you will have activities throughout your safari and you will not get bored. What is unique about golden monkeys? Golden monkeys are unique in appearance. They have an attractive outstanding colour, close to gold, hence the name. They are very playful and move quite fast, so if you want to take pictures you need to make sure you are steady and fast. Most of them are used to humans so they will not run away if they see people. 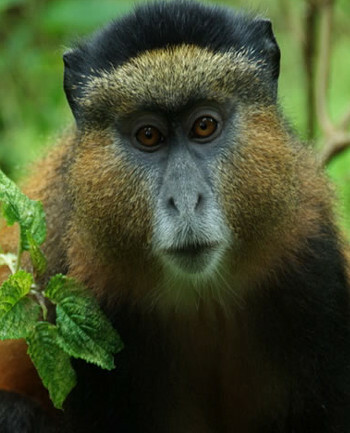 Golden monkeys are one more animal you need to see on your Uganda safari adventure. While there are so many other exciting activities such as gorilla trekking, white water rafting, and mountain climbing and so much more, golden monkey tracking is exciting and interesting all on its own.